Here we go again. Hard man Liam Neeson doing hard man shouty things. The difference? This time his shouting and punching is confined to the cabins of an aeroplane. 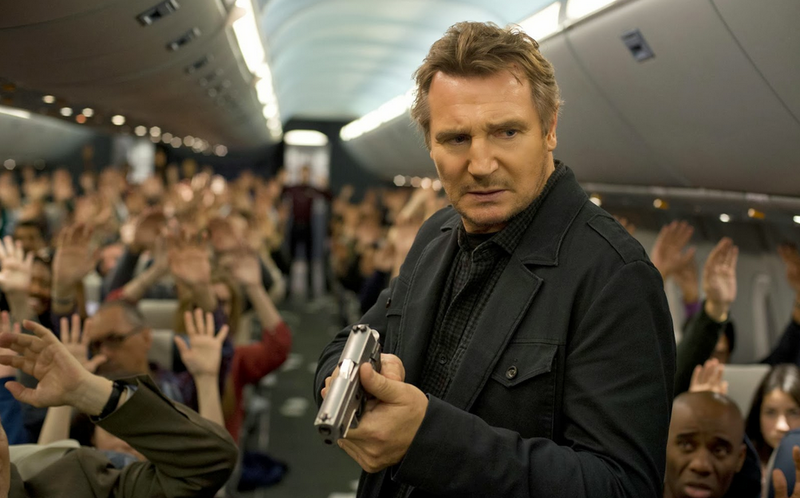 Neeson stars as Bill Marks, a grizzly, personally troubled U.S. federal air marshal who finds himself in the midst of a highly dangerous game of cat and mouse on board a non-stop flight from New York to London. A mystery villain sends Marks a message demanding one hundred and fifty million dollars be transferred to an off shore account, or every twenty minutes one of the flight’s passengers will be killed. A simple enough premise, would Non-Stop be able to do what films such as Speed have done and keep an audience invested and excited about a plot that would no doubt be extremely repetitive? To put it bluntly, no. The film fails to fully unlock the potential of its setting. Rather than create a claustrophobic sense of dread and intensity, the cramped plane cabin only serves to give the audience such familiarity with the surroundings that the lack of visual stimuli causes one to lose interest. The narrative states that every twenty minutes a passenger will be killed if the villain’s demands are not met, and what should have been tense intervals turn in to anti-climactic milestones that signal yet another portion of wasted time for the viewers. The plot consists of Marks highlighting a suspect, man handling them in to submission, realising their innocence, then moving on to another unfortunate passenger, and after the first two sequences of this nature produce the feeling of déjà vu, the following three or four turn from tolerable to pure tedium as the running time ticks slowly away. Despite my growing boredom, my inquisitiveness and curiosity got the better of me and I forced myself to remain as engaged as I could, I did after all, want to find out which one of the cast of stereotypical passengers was responsible. Was it the beautiful and alluring woman (played by Julianne Moore) who had gone to such effort to sit next to Bill at the beginning? Was it the shady looking, passive aggressive man who refused to follow instruction? Or was it, God forbid, the well educated doctor on board the flight who just happened to be a Muslim? I needn’t have bothered to stay interested, as the film’s climax is horribly rushed and themes that could have actually warranted expansion are addressed so quickly and without due care and attention that it leaves the audience wholly unsatisfied with the result. The decision to introduce completely new thematic content in the last ten minutes of the picture, rather than creating a blindsided plot twist, simply makes the previous ninety minutes seem even more pointless than it felt at the time, in fact it made me wonder whether a narrative from the point of view of the unmasked villain would have been more worth while. 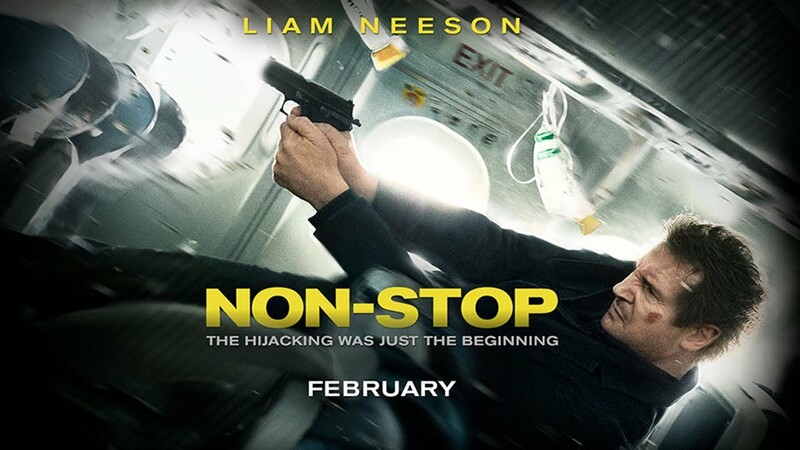 Perhaps one of the main problems I have with Non-Stop is the fact that I do not find Liam Neeson to be a believable or engaging action hero. I find his scowling, gruff demeanour to be rather tiresome and he fails to provide any integrity to the (already contrived) backstory that Bill Marks is given. I will admit to not having seen either of the Taken films, but Neeson just does not scream action star to me. The Neeson of Schindler’s List and Nell is the actor I want to spend time with, not this narrow eyed, fist first incarnation. Julianne Moore goes through the motions as confidant (or is she?) Jen Summers, a fair enough but extremely pedestrian performance from an actress infinitely better than the material. Michelle Dockery of Downton Abbey fame is unchallenged in her role as flight attendant Nancy Hoffman, but I have no complaints to lodge against her, impressing in the few big moments she has and not looking out of place amongst some of Hollywood’s elite. The real amusement comes in the misuse of Lupita Nyong’o, who surely must take the award for most hilarious non-role by an Oscar winning actress ever. As second flight attendant Gwen Lloyd, Nyong’o cannot have more than five lines to relay in the entire film, which has to be the most horrific waste of acting talent I have ever witnessed on screen. Overall, Non-Stop is a film that had promise, but in choosing to go down the path of so many other movies of this kind rather than breaking new ground it just becomes an exercise in how long one can last until they lose their patience entirely. The plot is predictable and pedestrian, and the talents of the varied cast are utterly wasted in a picture that any of them could have performed in their sleep. A few flashy action set pieces are not payment enough for the time the audience wastes in getting to them, and the final, unsatisfying reveal leaves one to wonder what else they could have bought with the money they used to pay for their extortionately priced cinema ticket. That’s the most negative review I’ve read yet. And is what I expected more people to say when I saw the trailer. This just looks totally wretched. AKA Taken on a Plane. Instantly better than anything that actually happened in the film!